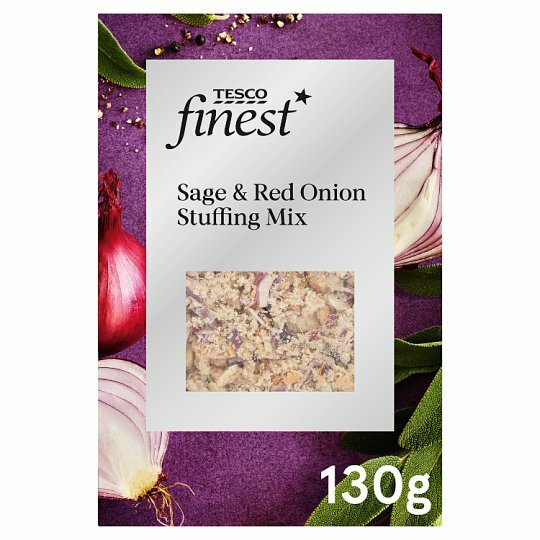 Stuffing mix with toasted ciabatta style breadcrumbs made with extra virgin olive oil (2.5%), dried red onions, croutons, dried sage and dried garlic. INGREDIENTS: Toasted Ciabatta Breadcrumbs (Wheat Flour, Water, Extra Virgin Olive Oil (2.5%), Salt, Yeast), Dried Red Onion (20%), Croutons (Wheat Flour, Rapeseed Oil, Yeast, Sugar, Salt), Dried Sage (2%), Dried Garlic, Salt, Black Pepper. Instructions: Empty the sachet of stuffing in a large heatproof bowl and mix well. Add 250ml boiling water, gently mix with a fork to ensure no clumps of dry stuffing remain, and allow to stand for 5 minutes. Transfer the mixture to an ovenproof dish, lightly greased with butter. Place in the centre of the pre-heated oven for 25 minutes or until crisp and golden on top.